Are you ready for one of the zaniest, drunkenest, (mostly) UNCUT episodes of Pete's Basement yet!? Well you better be, 'cause that's what's happening right here! The whiskey is flowing and the laughter is roaring. Pete goes off on a few rants about which portions of humanity should mercilessly perish in an fiery asteroid apocalypse, and that's just the first twenty minutes or so. The boys review some great books while they're at it, like Donny Cates' Venom and Justice League: No Justice! Ya' know what - just stop reading and hit the play button. 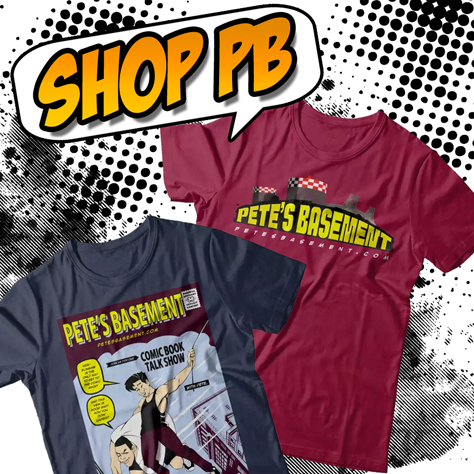 It's our 100th Episode Basement Blowout Extravaganza! Pete and the gang match wits in our first-ever Comic Book Trivia Drinking Game! PLUS, watch to win Fallen Angel artist J.K. Woodward's ORIGINAL ARTWORK and SIGNED COMICS!